If anyone has seen a pair of pinkish-red glasses lying around, please let me know. Thanks. 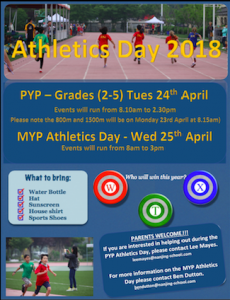 Grade 11 students are welcome to help for Athletics Day on Wednesday but you must tell Mr Hutchison today which of the CAS outcomes you plan to achieve when you help on the day and also put the Athletics Day activity in your CAS journal. Towards the end of the year when we have a better idea of the number of students leaving and new students enrolling we will relook at the trip numbers and assign students who have not chosen a trip. In honor of World Book Day on Monday, Amazon is offering 9 free ebooks to US customers through midnight on Tuesday. A reminder that Grades 10s ONLY will have extended Blocks 1 & 3 TODAY. All other students will have normal schedules on Monday. Students – please move quietly and avoid the LGR between Blocks 1&2 and Blocks 3&4. Thank you! REMINDER: ALL students will have extended Block 1 on TUESDAY and THURSDAY this week. Grade 4 will have their final MAP assessment at 8:10 on April 25. This week’s MAP schedule for Grades 6-10 is below for your quick reference. You have been asked to select an option to study as part of your course syllabus. If you have chosen Option A (Neurobiology and behaviour), you will go to Mr Newman‘s class during block 1 today. If you have chosen Option D (Human physiology), you will go to Mr. Mello‘s class during block 1 today. If you have chosen Options B or C, please report to your usual block 1 teacher. Much thanks to Mr. Hornell for his flexibility in making today happen.